The Coen Brothers' Burn After Reading (2008) could best be described as a black-hearted Beltway farce. Ex-CIA analyst Osborn Cox (John Malkovich) is blackmailed by the gym staff who find his half-finished memoirs, cuckolded and then divorced by his wife. These strands of plot then align unhappily with bloody consequences. Trouble is, I've made it much neater - in every sense of the word - than it it in practice. 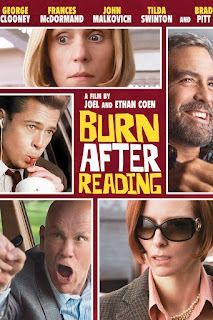 Despite a great cast (Malkovich, McDormand, Swinton and Clooney) and some great scenes (mostly involving Brad Pitt's gym bunny) Burn.. seems curiously underwritten, lacking coherency and maybe at least one rewrite away from being the sum of its parts. Granted - Coen Brothers films can feel a little foggy by today's cinema conventions precisely because they leave space for the viewer to form their own ideas as to what's really going on inside or outside their character's heads. When that works well, you get the woozy phantasmagoria of Barton Fink. When that doesn't quite work, you get Burn After Reading. Curioser still - the film, with its fatalistic 'stuff happens' credo, is strangely apolitical for a Washington-set comedy. Not every film set in the capital has to be political, of course, but for a film about (ha!) the intelligence community to have no such context is a wasted opportunity. Even minor Coen is, on balance, better than no Coen. Even The Ladykillers. And for goodness sake this is much better than The Ladykillers.